Psychology Matters. 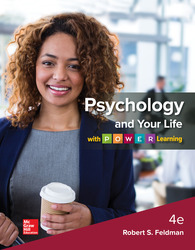 No matter what brings students into the Introductory Psychology course and regardless of their initial motivation, Robert Feldman's Psychology and Your Life with P.O.W.E.R. Learning draws students into the field by connecting psychology to their professional and personal lives. Designed specifically for the accelerated Introductory Psychology course, Psychology and Your Life takes into account the diverse population of students enrolled in college today.